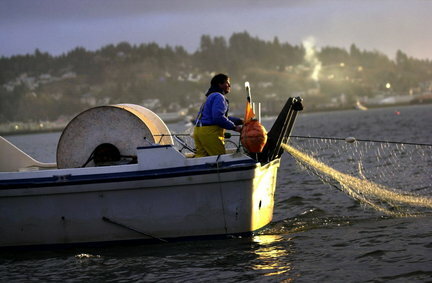 For the first time in three years, commercial and sport fishermen will be allowed to catch Chinook salmon all along the Oregon coast under a fishing plan approved Thursday by a federal panel. As first proposed in March, fishing from May to September will still be limited because of concerns about poor Chinook returns to the Sacramento River in recent years. Sacramento fall Chinook provide the bulk of Oregon's ocean catch. But the Pacific Fishery Management Council's decision is still a relief for a salmon industry that relies on Chinook and saw its largest closures ever in 2008 and 2009. California fishing was also shut down those two years, and will reopen on a "very limited" basis under the council's plan. "It will be good to have fishermen back on the water," said council Chairman Dave Ortmann. Fishing for bottomfish at depths greater than 240 feet ends at the end of March. Fortunately, the South Jetty has been fishing very well for all the bottomfish species normally taken from it, as well as all three species of sea perch — redtailed surfperch, striped surfperch and pile perch. Recent weather has ensured that jetty outings have not been that much fun, no matter how good the fishing. In the previous 10 days, the spring Chinook fishing on the Umpqua River has been exceptional, with lots of salmon caught and quite a few big ones. A number of salmon weighing more than 40 pounds have been landed and as reported in last weekend's The World newspaper, a 54-pound giant was caught. So far, Bob House of Bob's Market hasn't heard of the giant salmon, but if it was indeed caught, he will. So far, the salmon derby sponsored by Wells Creek Market has yet to break the 36-pound mark. GOLD BEACH — John Anderson took an old fishing tool, added a new twist and promptly ushered spring to the Rogue River on Tuesday — while perhaps starting a new fad along the way. Anderson's modified plastic diver played a key role in this year's first confirmed catch of a Rogue spring chinook, the opening salvo to a season that always brings promise to anglers locked in a love-hate relationship with the Rogue's most prized denizen. With winter steelhead season in full swing on Tillamook area streams and since my other favorite pastime is eating I thought I’d share some of my favorite places to eat around Tillamook before and after a day of steelhead fishing. Not only do I like good food but I like to get a good deal. You will find both at these places.